About a month before my best friends wedding, I hosted her bridal shower with a few of her closest friends and fellow bridesmaids. I had the best time returning the favor for her after she threw my shower in March. I wanted to do a floral and pink shower for her. So, we took the floral theme and ran with it. Being from the South - we have to put out quite the spread! We went healthy with fruit skewers, caprese salad, regular salad and.... water? 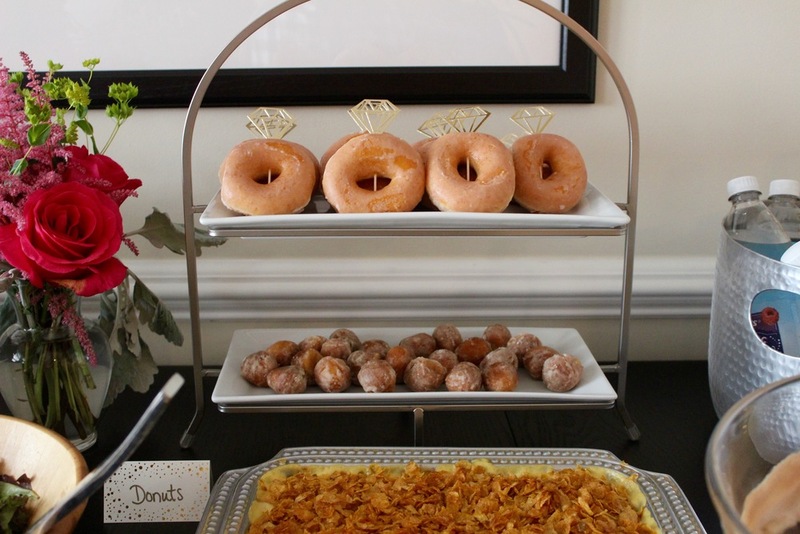 Then on the fun food end, we had lemon cupcakes with raspberry icing, donuts, ham and cheese croissants, curried chicken salad cups, and cheesy potato casserole (YUM). We had plenty to drink - a mimosa bar, coffee punch, and sangria. 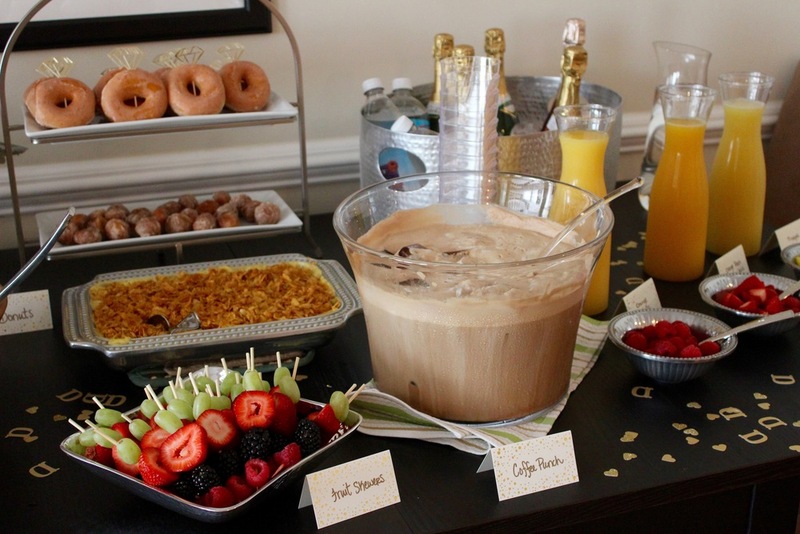 The mocha coffee punch was the biggest hit! Get the recipe HERE. I followed the recipe close, but added in coffee ice cubes to keep it cold through the shower. I just made them the night before and popped them in as needed. I was loaned (maybe given? Haven't been asked for it back yet :) ) these Rifle Paper Co. make your own garland to use at my wedding and I have used it so many times since! I plan to use it plenty more too! 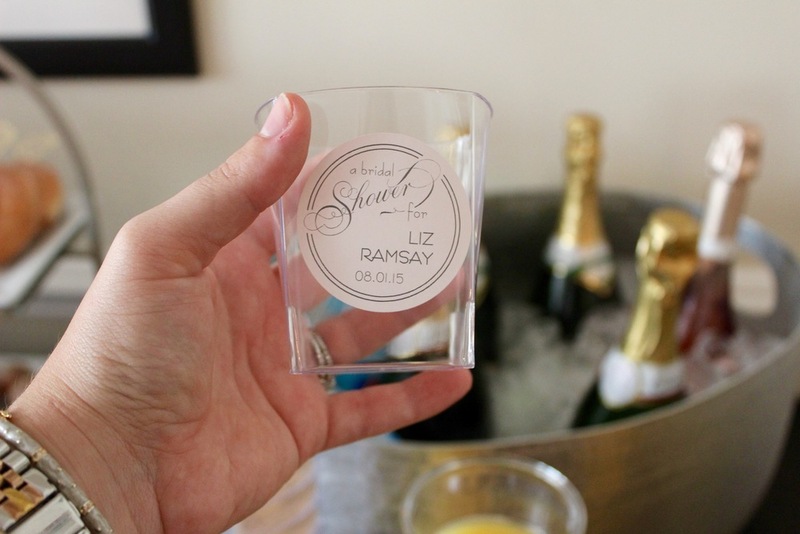 Such a cute way to personalize any party or shower! I printed out the bridal advice cards and brought the card holder from my wedding to use as a place for people to place them. Love how it turned out! I did all the floral for the shower myself since I love doing it! I think it turned out well! Pop, Fizz, Clink sign || Bridal advice cards || Card holder (terrarium now!) 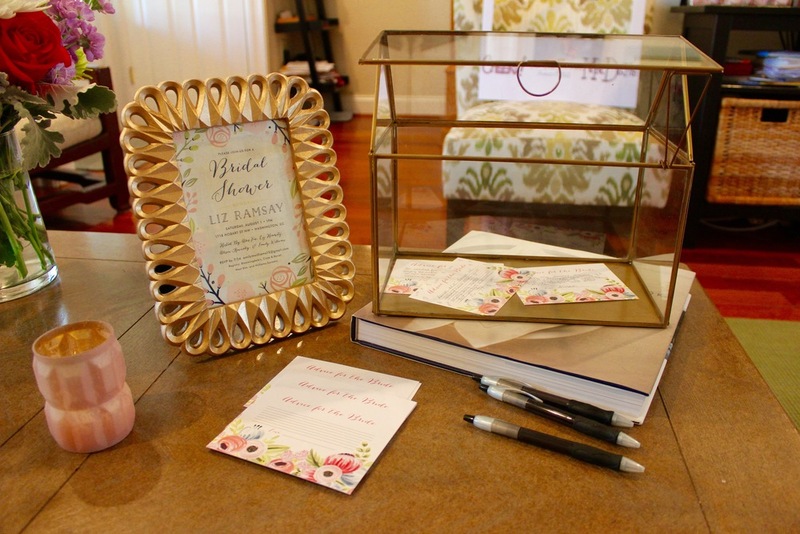 || Personalized hanger || Inspiration for the "Days 'til shes hitched sign"
Party favors! Sugar scrub - Did you catch the post earlier this week? AK, one of my fellow hostesses, made this awesome Polaroid cut out! Didn't she do awesome?? Above - the beautiful bride and me! I get so much inspiration from Pinterest and love pinning new things to help get my crafty side going. We all need a little help now and then! I use it for many different purposes- new recipes, style inspiration, workout tips, home decor wish lists, and finding new crafts. Follow along on Pinterest!